On Thursday 1st March Hazel gave us an interesting talk about Yorkshire which some Austro Brits will be visiting in April. Most of the members on the trip were there and others too. We knew that there are lots of really old pubs but we didn’t know that there aremore than 360 different kinds of beer. Beer is brewed in York and also chocolate is made so it will be a difficult decision for the trip members between drinking beer and eating chocolate, not to mention doing some sightseeing. 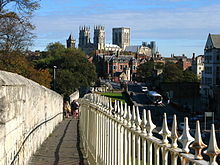 We heard that there is lots to see in York from the Minster, the castle and the medieval street, the Shambles to museums and walks around the ancient walls. Hazel told us something of the history of Yorkshire beginning with the Celts and going on to invasions and occupation by the Vikings and the Romans for whom York was the capital. During medieval times many abbeys and priories were built and Yorkshire became wealthy on sheep farming and the wool trade. During the Industrial Revolution wool textile and coal mining towns like Leeds and Barnsley grew up. 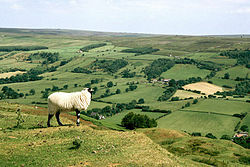 Yorkshire is considered to be an area of outstanding beauty with the North York Moors and Yorkshire Dales National Parks. We saw the differing landscapes, the traditional stone walling and ancient stone built farms and heard about the wildlife, in particular rare birds and interesting flora. This area is of course a paradise for walkers. Hazel then moved on to the coast, first to Scarborough which was one of the very first health resorts then to Whitby, both most interesting and well- loved as seaside resorts.